Mary Cassatt wrote that women must choose between Art or Family & Hearth. That Mind and Soul cannot properly support both. As an early 20 something, I dismissed that as antiquated. Fast forward 20 years, to me as mother, cook, and painter, I understand. How the Heart and Mind struggle to create each side of itself equally. Frida navigated these waters herself. 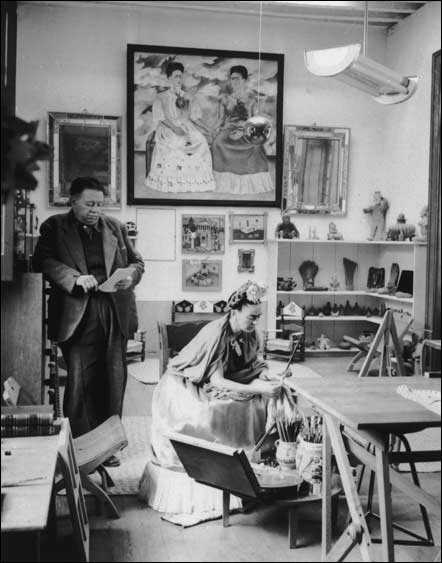 As Artist and as Wife, Artist & Homemaker… “We could not have a child, and I cried inconsolably but I distracted myself by cooking, dusting the house, sometimes by painting…” Though she did not have children, Frida’s focus largely orbited her husband, Diego Rivera. For Frida was most prolific as Artist when apart from Diego — and impassioned Wife and Domestic Goddess when together. 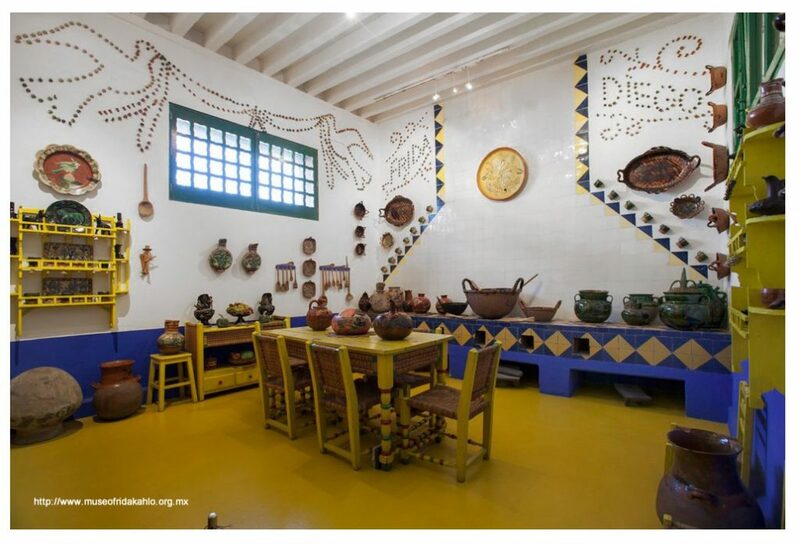 Painting early, stopping by eleven to cook/bring Diego lunch and ensure a visually vibrant home with fresh cut flowers, indigenous foods, sculpture, art, monkeys, dogs, talking parrots, beautiful tablescapes… For Frida believed in attractive surroundings — starting with her Kitchen Table. Teaching even her Art students to move servingware and decorative items around the table to find the most “pleasing manner…” From her kitchen (and home) outward, to see “in a way that was much different from the usual.” That enthusiasm for daily Beauty mattered. That Food and Rituals of Eating, mattered. And still does. Here is where I ask you to join me! When I wrote about Frida and her Cooking in October, many wanted to read her recipes. But I confusingly learned that Frida loved to cook and that she did not, that she preferred to host parties, decorate elaborately, or that her cook cooked… Regardless, here are a few (of many) recipes Frida’s stepdaughter remembers cooking and eating in their family kitchen. Most of the books I’ve read recently highlight dishes rooted in pre-Colonial, indigenous ingredients but the following recipes, most of us should be able to make from what we find in our shops and market places — swap in what you can’t find or don’t want to use such as butter or avocado oil for Lard, jalapeño for exotic chiles, etc. 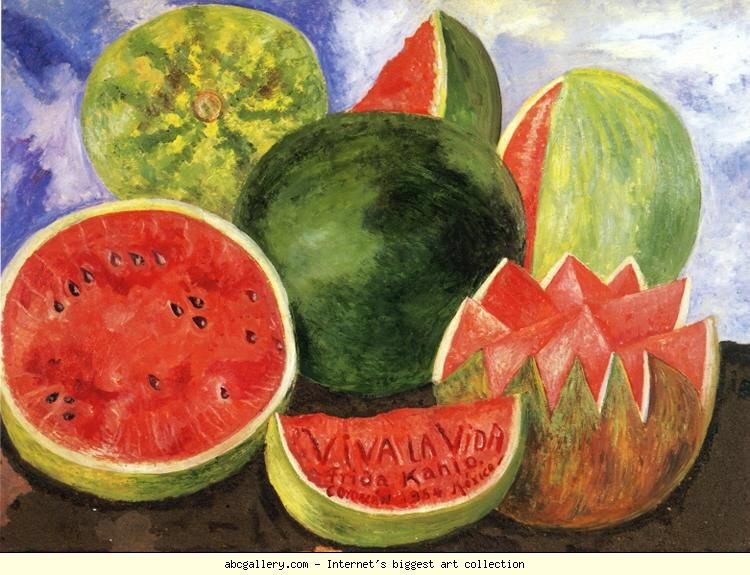 For Heritage and Traditions played much loved and revered roles in Frida’s (and Diego’s) Art as well as in the elevation of everyday aesthetics. I’ve only cooked her Shrimp Tacos but plan to cook the rest over the coming weeks… including Diego’s beloved Molè. Join me! Sauté the onion and chiles in butter until the onion is translucent. Add tomatoes and salt/pepper to taste. Cook for 10 minutes, until the tomato is thoroughly cooked. If the sauce becomes too thick, thin with a little chicken stock or water. Add the shrimp and cook 2 minutes, just until they are heated through. Fill the tortillas with the shrimp mixture and serve piping hot. Or serve the shrimp mixture with the tortillas on the side. Note: I’d grill the tortillas and garnish with chopped cilantro and fresh lime. Sauté the noodles in hot oil in a saucepan until golden. Drain off all but three tablespoons of oil. Puree the tomatoes with the onion, garlic, and salt to taste. Add the puree to the noodles and simmer together until the mixture has thickened. Add the parsley and chicken broth to cover. Cover the saucepan and simmer for 20 minutes, until the noodles are tender and the broth absorbed; add more broth if necessary. Discard the parsley leaves. Pour the noodle mixture into a heated serving platter and garnish with chiles, avocados, cream and cheese. Puree the tomatoes with the onion, garlic, oregano, and salt to taste. Sauté in hot oil until thickened. Puree the beans with their cooking liquid. Add the bean puree to the tomato mixture and cook 5 to 10 minutes to blend flavors. Serve soup garnished with oregano, cheese, and tortilla squares. To make Sauce: Soak the chiles in the boiling water for about 10 minutes. Puree and drain. Sauté the onion and garlic in hot oil until translucent. Add the puree and salt to taste. Cook for about 10 minutes to blend flavors. Fry tortillas very briefly in hot oil. Dip in sauce, fill with chicken, and roll up. Arrange on a serving platter [or on serving dishes] top with more sauce, then with sour cream. Sprinkle with crumbled cheese. Mound the flour on the counter or in a bowl and make a well in the center. Fill the well with the lard, sugar, and rum. Mix well to make a smooth dough. Roll out 1/2 inch thick. Using a round cookie cutter of desired size, cut the dough into rounds and place on baking sheets. Bake in a preheated 350’F / 175’C oven until golden, 12 to 15 minutes. Remove the cookies from the oven and toss with confectioners’ sugar to coat well. Peel the potatoes and parboil them for 1 minute. Set aside. Simmer the tomatillos with the water, chiles, and salt to taste until tender. Let cool slightly, the puree with the cilantro. Heat the lard in a skillet and sauté the onion until translucent. Add the tomatillo puree and cook for 10 minutes. Stir in the potatoes and continue to cook until potatoes are tender, about 15 minutes. Note: Find smallest potatoes you can. You may parboil your potatoes 1-2 minutes longer if larger than small. Heat the lard in a skillet. When it starts to smoke, add the onion and sauté until golden. Add the beans and cooking liquid. Mash the beans to make a puree. Season with salt to taste. When the Beans are well fried and pull away from the bottom of the pan when stirred, remove from the heat. Place the fried beans on a serving platter, shaping them into a log. Sprinkle with cheese and garnish with totopos. 2 guajolotes (small turkeys) or 4 large chickens cut into pieces and cooked in a strong broth with carrots, onions, and herbs ** Reserve the broth. ** There’s a bit of discrepancy between this recipe and others, mostly in terms of herb count. Such as 2 cloves versus 8, 1 teaspoon anise versus pinch, 4 garlic versus one head… So use intuition and cook to taste. Quickly fry the chilies in hot lard, being careful not to let them burn. Place the fried chilies in a large saucepan in hot water to cover. Bring to a boil, then simmer until soft. In the same hot lard, sauté the onions and garlic until translucent. Add the tortillas, bread, almonds, peanuts, cinnamon, reserved chile seeds, sesame seeds, pumpkin seeds, anise seeds, cumin seeds, thyme, marjoram, oregano, coriander seeds, peppercorns, cloves, raisins, and chocolate. Sauté for a few minutes. Puree this mixture with the tomatoes and the chiles. Strain the puree and cook in 8 tablespoons lard. Stir in sugar and salt to taste and 2 cups turkey/chicken broth. Simmer for 20 minutes. Add the turkey, and simmer for 20 to 25 minutes to blend flavors. If the mixture is too thick, add more turkey broth as needed. 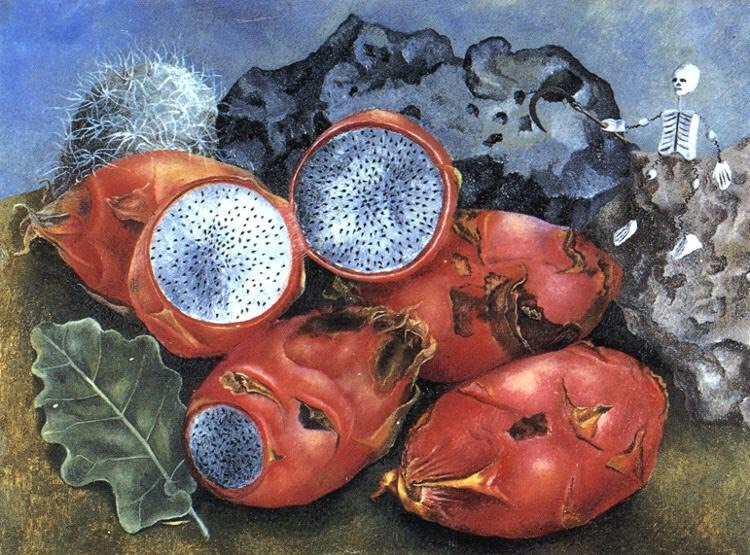 Note: Chihuacles are special chiles from Oaxaca: you can substitute cascabel chiles. The Diary of Frida Kahlo: An Intimate Self-Portrait. Intro. by Carlos Fuentes and Sarah M. Lowe. This entry was posted in Artist Kitchens, Dessert, Entrees, Uncategorized and tagged art history, Artist, Artists and Their Kitchens, Artists Kitchens, Black Bean Soup, Diego Rivera, Food History, Frida, Frida Kahlo, Mexican, Mexican Food, Shrimp Tacos, Tequila, The Creative Palate by Abigail. Bookmark the permalink.